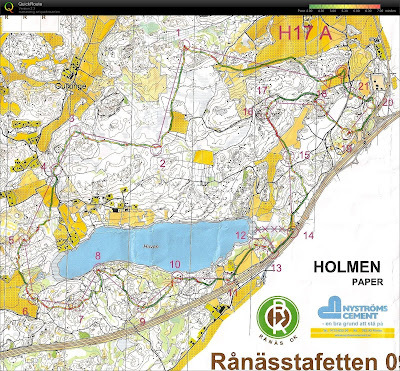 Nice 5 man relay in Upplands. Lidingö had a strong team, but we had no chance against the impressive OK Linné team, who finished a massive 10 minutes in front of us! We were 3rd though, not far behind a pretty good Kalevan Rasti team. My race was ok, but not as good as it should have been. I ran the 2nd leg, went out in 9th, at the 4th control I had run to the lead, but on the second half of the race I was really scrappy - I never lost more than 25 seconds on any control, but I lost 10-20 seconds a lot. Came back in 3rd, around 2 minutes behind the leader, and was about 1 minute down on the best time on my gaffle, but I would have liked to have been 2 minutes quicker maybe.